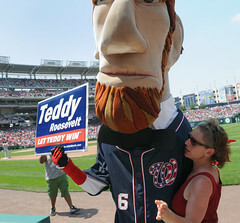 After high expectations are dashed, even Abe Lincoln implores the Nationals to Let Teddy Win | Let Teddy Win! 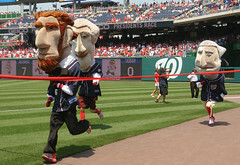 The “Let Teddy Win” buzz hit a fever pitch on Memorial Day at Nationals Park, with rumors spreading rampant that after high-level meetings in the Nats’ front office, a decision had been made to finally let Teddy win. From the stands to the press box, from Twitter to even the Phillies’ TV and radio broadcasts, word was spreading to watch for a breakout race from Teddy Roosevelt. Even outspoken outfielder Jayson Werth, who had refused to watch Sunday’s race, stepped out of the dugout and onto the field to see the big event. Fans and reporters alike approached to say they had come not to see Roy Halladay and the Phillies, but to see Teddy take victory #1. Yes, everybody got the message. In possibly the most disappointing performance in five years, Teddy ran wire to wire in last place, and failed to even finish. Even showboat Abe Lincoln, after taking his 13th victory of the season, grabbed a Let Teddy Win sign from the crowd and held it up in support. Nats management clearly doesn’t buy into the notion that Teddy must win to break the curse that keeps their team in the basement; but after roughing up Phillies ace Roy Halladay only to end up on the losing end of another 1-run game, why continue to tempt fate? Too stupid! Hard to fathom how a clannish family of Cement Heads was awards this franchise five years ago. Do they care about the fans? NO. If the streak is broken, how about July 4? What should happen is a celebrity should wear the “Teddy” and then after the win take the head off and show his or herself to the crowd. It’s a boost to the Nats crowd and makes for good publicity. 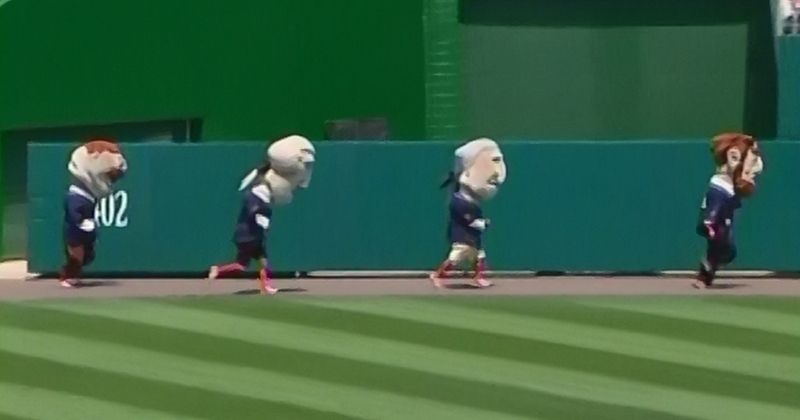 umm ya’ll know it’s just a race w/ bobbleheads,right?